It would be written as a "choose one" if you were choosing between: trash the War Flag; or discard a Treasure for the Attack. Arguable. Not only do you give two choices which card to use, you also do something else with each, which sets them apart further. Given this, using a grammar structure that by default points to the last noun is all but clear. $3. When you play this, trash this or discard a Treasure and each other player discards a card for each coin in its cost, and then draws until they have 3 cards in hand. When you play this, trash this or discard a Treasure, then each other player discards a card for each coin in trashed or discarded card's cost and draws to 3 cards in hand. Personally I see it fitting the brief, but, eh, if a judge thinks that it doesn't fit the guidelines, chances are you are better off submitting something else than arguing about it. A sequence of one-shot cards: effectively Traveller for Treasures, but in reverse order. When you discard this from play, exchange it for a Ruby. When you discard this from play, exchange it for a Pearl. When you discard this from play, exchange it for an Emerald. When you discard this from play, exchange it for a card costing up to $2. Considering that these are Treasures, I think you would be safe to just exchange them on play. The artist's intent is one thing, but honestly, if this is about visibility, I'm not sure we should count cards where the gender is not visible. I know now that Tormentor is a woman, but I wouldn't have without this thread. This is actually a situation where other languages can make clear Tormentor is female by choosing the appropriate name. I'll suggest to take care of this in future German editions. Wait, so with Chemist you get both the Action and the Card when you spend the Villager? Without your explanation, I would have guessed it works like Butcher in that you lose what the token does. Another player played three Torturers, you discarded, and the card in your hand is Library? This is pretty weak. Sure, it's nonterminal, but apart from that it's worse than Coppersmith. 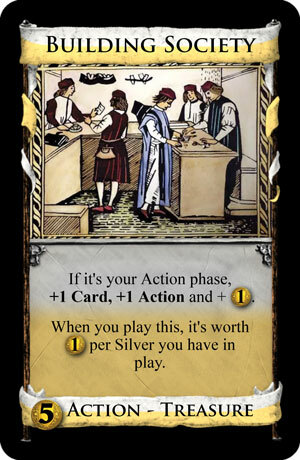 For instance, it is limited to at most +4$, and unlike with Coppers, you don't start with Silvers in your deck. Of course Silvers are better than Coppers, but you forego buying something else instead. It doesn't produce Coins but draws. I agree that it seems weak but like Shepherd it could be great "support draw", i.e. when you have something else in your deck that draws this might be pretty decent. Oh wow, sorry, I completely misread it, then. That's quite a bit better, but on the other hand I wonder wether a deck that's as full with Silver wouldn't be better off with a terminal draw card like e.g. Smithy. Of course you can also use it in an engine deck, but if your engine can reliably draw this and at least two Silvers, it's probably going fairly smoothly anyhow. So now that you win, you win more, and before, it does very little to get you there (mainly hoping for lucky draws). Variants and Fan Cards / Re: New fan based alchemy cards. Sure, do what is fun to you. It's not like I mind more Alchemy cards. I'm just giving you the reasons why it's unlikely to happen on the official side. That’s why they can just do an update pack they did it with the first 2. They were like 10$. Besides for those of us who have guilds already if we want Coffers for guilds we would have to spend a lot more than 10$. That change did not come with an update pack for guilds did it. Guilds isn’t the best expansion either yet they did make changes and did re print the box. It would cost the same amount if they created new alchemy cards and new alchemy box. It might be even cheaper because they still put cornucopia and guilds together. They would of had to reprint cornucopia too. 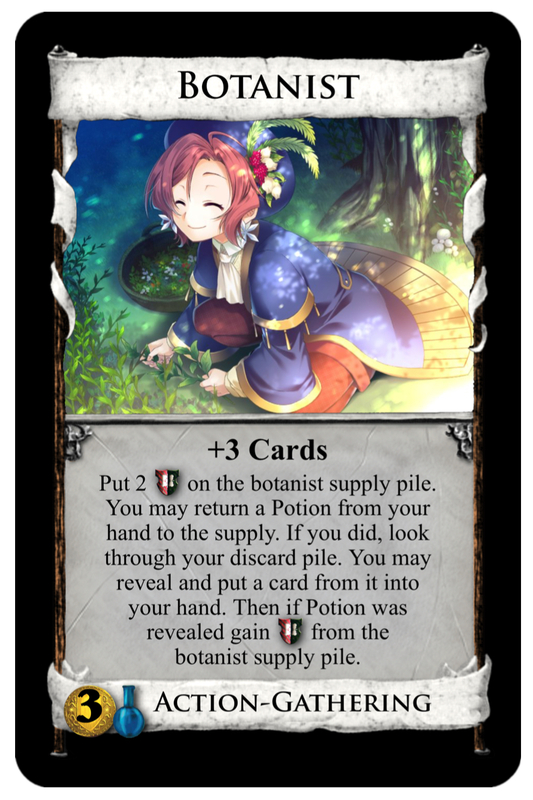 And with alchemy all they would have to do is create the new cards new insert and put them into an update pack they would not have to create a whole new box, there’s plenty of space for 7 or 8 cards. They just don’t want to because it’s not popular. Which is why I’m creating my own to add. Because they have given up on it. They could of kept guilds the same. After empires came out they kept prosperity the same, I mean isn’t it weird playing with bishop and farmer’s market in the same game. Yet they changed it. I don't get what your problem is with Bishop and Farmers' Market. Those are two completely different cards that use different mechanics. And I'll say it again, the first and second edition of Guilds are mechanically the same. You miss nothing if you don't buy the second edition. This is completely different than your suggested changes to Alchemy. Besides, Guilds IS a lot more popular than Alchemy. If you were to create some cards with the main purpose to sell them alone, you should put that effort into a completely new expansion. First, it won't be stained with Alchemy's lack of popularity. Second, it will be received as something new and thus more interesting. Third, compared to a 10-card upgrade pack, you get more for your money, because small expansions contain less cards but require the same organisational effort to ship, store, sell, etc.. They wanted smaller expansions, then why did they bother combining guilds and cornucopia then? It goes against what they wanted. And they never bothered to make another mini expansion to combine it later with alchemy did they now. Since they obviously changed their minds on smaller expansions they should make alchemy bigger officially. Add more cards to it. Make it so it can be played by itself and then of course a make a few more cards that don’t have potion in their cost. Making it a well rounded expansion on its own. After all they have made many changes to other expansions. Replacing cards in the base game and intrigue. Changing guilds take a coin to +1 Coffers. Adding bane to cornucopia. They need to make changes to alchemy too. And while their at it prosperity needs a few 2$ costing cards. Cause as is the 3$ costing cards aren’t that great either. I’m just saying it’s unfair to alchemy fans. To make changes to all the other expansions but to leave alchemy all alone on it’s own. The current German publisher isn't the German publisher from back then, so you can't hold them accountable for having other ideas than back then. Alchemy is a small set now, and there's no good reason for a publisher to make it big. Intrigue and the base game were always much more popular, but they had weak cards that were replaced to make them better, and also those replacement cards were enough to make up a small expansion consisting only of them. Replacing all the weak cards in Alchemy and adding new ones is practically the same effort as creating a new expansion from scratch, but more restricted in what one can do, with lots of people having to pay for cards they already have, and Alchemy still being overwhelmingly unpopular. It's worse than creating a new expansion in every respect. Besides, the Guilds changes are no new cards, they play exactly the same, and the same goes for Cornucopia's bane tracking card. That doesn't mean you as a fan can't try to do it yourself, but from a publisher's perspective a second edition of Alchemy means putting immense ressources into something that didn't work the last time. But obviously he wants us to come up with our own alchemy cards because half the box is empty. That’s why I’ve got so many ways to use potions, or to make it easier to gain higher costing potion cards or to give certain actions that act also as a potion. Hopefully if you played a random game with just alchemy you would get at least one of these new cards that make it easier to get potion Action cards. While I doubt Donald X has strong feelings about fans trying to fill Alchemy's gaps one way or the other, he mentioned that Alchemy started out as a big set, and was split up due to the German publisher at the time requesting smaller sets (they wanted to sell them in tiny packages, thank goodness it didn't come that far). What I don't think we know is whether the cards would all be centered around Potions. Taking any other big expansion as a reference point, the answer appears to be no. Even Seaside, which has an overarching "future turns" theme isn't all Durations. It also has tokens, mats, topdecking, and even some off-topic cards. So if you want to fill up the gaps in Alchemy, maybe it would be more rewarding to create new stuff that goes with Potions on a meta level, than just creating more of the same. Potion cards are tricky but powerful, maybe other tricky but powerful mechanics would go with them. And they also have cards depend on each other, maybe that's a thing to explore. Now that I write this, I realize that Dark Ages actually worked with both of these ideas. Or perhaps you like how Potion cards have you pay for cards in a new way, and want to invent something that goes with that (like Empires' debt did), or you like how the set is slightly weird, and you want to do more weird stuff, or you like the magic theme (gasp) and want more mechanics derived from magic themes, like Nocturne does. 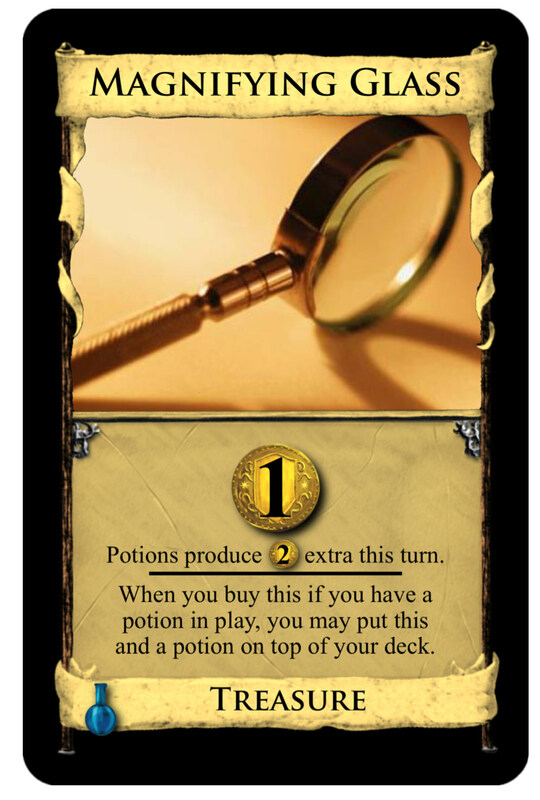 My point is, filling the gaps to make Alchemy a better set doesn't necessarily mean you have to create more Potion cards. Having overly many Potion cards in a kingdom removes the tactical consideration of wether or not to get a Potion, and the game suffers as a result. There's a reason Empires isn't all debt cards and Adventures isn't all Reserves. Reveal and discard up to 4 Victory cards from your hand. If you discarded 4, gain a Gold. It seems similar to but worse than Quest and its name is a bit redundant with Tax', though. Losing track doesn't mean the card can't be played anymore, but as that only plays a role for one-shots and the Project can only be triggered once per game, I suppose it's half so bad. I don't understand the point you're trying to make here. You say that if the card leaves the play area that means the Project "just loses track" of it. While that's true, it does nothing. The card will still be played each turn, set aside or not. And my remark was that this only matters for one-shots (or to be more precise, cards that remove themselves from play), so it doesn't come up too often. So, lose track does nothing and I don't see why you mention it, but it should still be fine. I guess I don't understand how the lose-track rule works then. I thought if the card leaves the play area, then it doesn't know where it is anymore and so can't do anything with it. How is this different from, e.g. Procession and Island? If what you're saying is true, then why can't Procession find Island and trash it? Because trashing is only successful if the card is indeed moved to the trash, whereas playing a card TRIES moving it (into play), but doesn't depend on it. This has been this way since, uh, Throne Room and Feast? To further elaborate, lose-track only keeps a card from being moved, not from knowing what it does. Trashing depends on moving a card, playing doesn't. 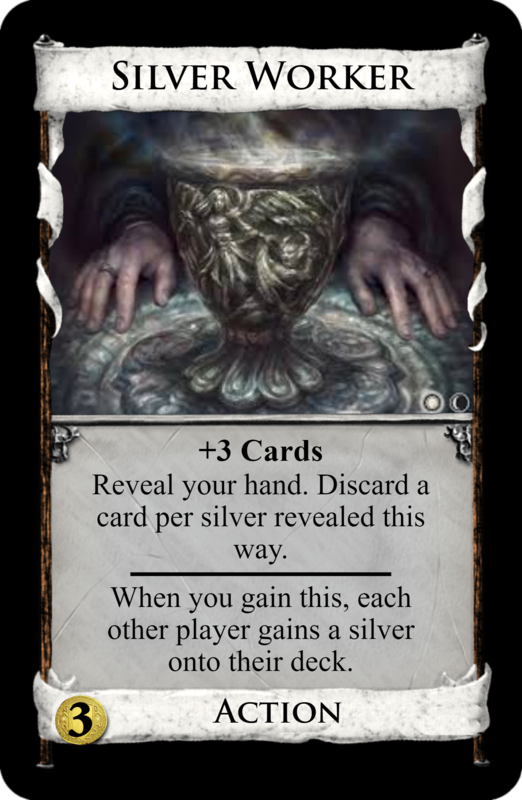 I have redone magnifying glass it’s also posted in the first post along with most of the other cards for alchemy I’ve come up with. When you gain this, put it and a Potion you have in play onto your deck. If you have no Potion in play, this will just fail to topdeck one. As there are only very few ways to gain a Potion cost card without buying it, it should hardly make a difference otherwise. Here’s a brand new idea I had for alchemy. Since there’s only 3 official cards that are gathering I thought I’d add one to alchemy. Why does it let you return Potions to the supply? That seems to go against the rest of the card.